Although there are lots of awning manufacturers out there, the choice for Sprinters is limited by their height and the ways you can attach the awning to the van. Retractable ones that roll up into an aluminum or plastic case bolted to the vehicle. “Patio” style ones that are like a big roller blind with the legs bolted on to the side of the vehicle (like on larger, older RVs). Fold-out ones that often zip up into a fabric case attached to the roof rack. Stand-alone tent style awnings that clip on to the side or back of the vehicle when they are assembled. The most common type to find on a Sprinter are the case style, sold either by Fiamma or Dometic. There’s a reason for that, which we’ll explain below. The older style high roof T1N vans have a relatively flat vertical area above the sliding door that you can bolt a wall mount awning to. However, the newer NCV3 style vans curve in every direction and the sliding door reaches almost to the roofline. 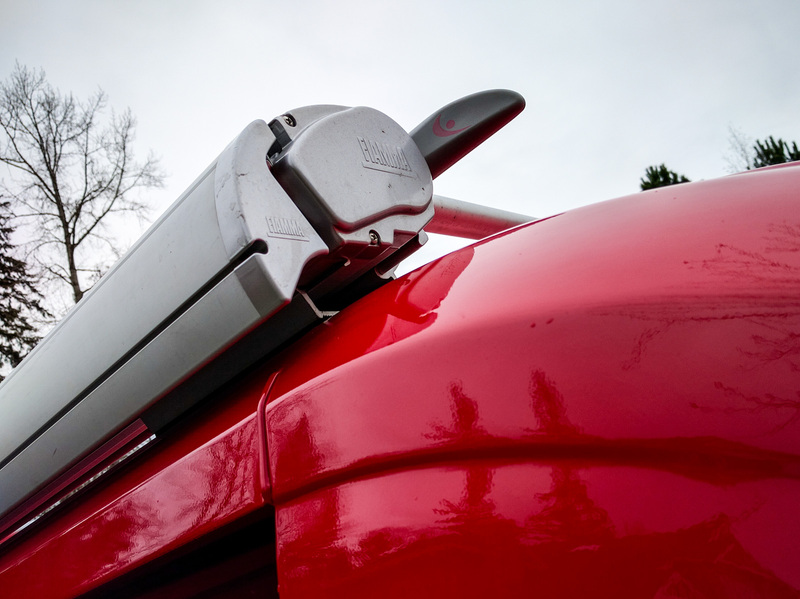 Because of the limited placement opportunities, any awning on a modern high-roof Sprinter is likely to either be bolted to the roof rail area at the very edges of the roof, or to a roof rack that’s mounted on the roof rail. That location is about 9 feet off the ground, so the awning you mount has to deploy without needing to reach up to it. For most people the height of the high roof vans rules out the fold-out awnings that zip into a bag and the stand-alone ones that need to clip on to the vehicle above the sliding door. It’s theoretically possible to use either type if you have a ladder to reach that high, but it causes practical issues. Plus, most of those awnings aren’t designed for super-tall vehicles so they end up on a sharper than normal angle and might not cast as much shade as you’d like. They also don’t tend to come in the XL lengths that you can fit on a Sprinter. Obviously if you have a standard roof van, both of these options are back on the table. They tend to be cheaper than the patio and case style awnings because they don’t have complex mechanisms. The standalone tents also allow you to “claim” your camp site while you drive off for the day. Rhino-Rack make a manual fold-out awning called the FoxWing that extends around from the side to the rear of the vehicle. ARB also make a manual fold-out awning for less than $300. It’s made from PVC lined polyester and has telescoping/locking poles to hold it up and away from your vehicle. They make mesh bug screens and full tent walls to clip to the awning. The awning comes in three lengths – 1250, 2000 and 2500mm (that’s about 4′, 6-1/2′, and 8′ respectively). SmittyBilt have a very similar style awning. In fact, it’s possible that several brands are actually manufactured at the same facility. Oztent’s 30 Second Expedition Tent and separate fly are only 6’6″ tall, but the fly can be raised higher than this to attach to the Sprinter. The KingCamp Canopy tent pitches like an awning – if you can reach your Sprinter’s roofline to attach it there. There’s always the old standby of the ubiquitous 10’x10′ pop-up canopy tents you see at farmer’s markets, race venues and so forth. The problem is, they really don’t play nicely with the sliding door on Sprinters. Basically, even when it’s at it’s highest, the top of the tent will block the door making it hard to get in and out of the van. Patio style awnings are the type with legs that are permanently attached to the side of the van. They look like an exposed roller blind. Because they are wall-mount rather than roof-mount, they will only work on the older T1N style vans. They are pretty basic, and the mechanism sticks out from the side wall of the vehicle. This is the type of awning you often see lying on the side of the road after it unfurled while the vehicle was driving along, and either caught the wind or something stationary which ripped it off. While it’s theoretically possible to use one of these on a T1N van, it would take a lot of co-ordination to mount it so that the sliding door doesn’t hit the leg. They just don’t seem like a good idea in comparison to case awnings, and they aren’t considerably cheaper. The only real benefit of patio awnings is that typically you can buy them in custom lengths to the inch or six inches. This is the type of awning that you’re most likely to see on a Sprinter conversion. They can be five times the cost of a fold-out awning that zips away into a fabric bag, but they typically have a thicker fabric and are designed to fit on taller vehicles. The case style awnings also come in multiple lengths up to 14-1/2 feet. That’s plenty long enough even for a 170 wheelbase Sprinter. The typical awning you see on NCV3 Sprinters is the Fiamma F65s. It curves around the top of the van wall to the roof. It mounts either onto the bare metal of the roof or on to the factory roof rails. This awning completely covers the factory roof rail, so if you were wanting to use a roof rack, you have to buy or fabricate an adapter to squeeze the roof rack tower inwards on the roof. T1N Sprinters can use a wall mounted awning instead. Fiamma make this style as well; the F45s range. The F45s might also be useful for your new-style van if you already have a roof rack that takes up the roof rail area that the F65s would attach to. We bought an F45s and mounted it on to L-brackets suspended from the roof rack bars. We bought our Fiamma awning from Panther RV. Panther sell a lot of awnings and ship nationwide. They supply many of the upfitters in Washington and Oregon. They had several in stock when we visited, and they can special order any Fiamma awning with about a month’s lead time. Panther also sell Dometic awnings (also known as A&E). Some earlier models (Horizon and Oasis) were made by/use the same mechanism as Fiamma. Their newer models that would be most appropriate for Sprinters are the wall mounted 9500E (electric) and 9500M (manual). Carefree awnings sell their Freedom model in both a wall and roof mount, with manual and electric options. 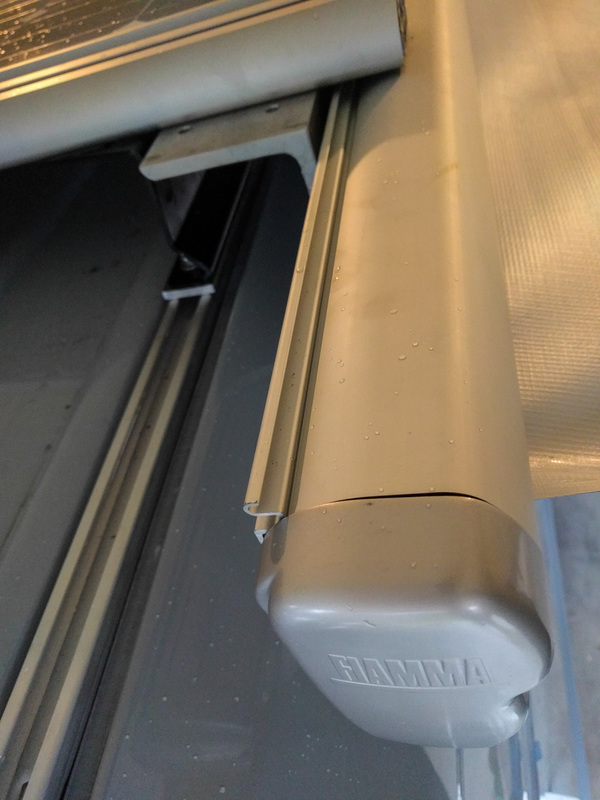 They make roof mount brackets specific for Sprinter vans, but they require you to drill through the roof metal and into the cross members even if you have the factory rails attached – something that Fiamma does not require. Pretty much all the awning companies have big disclaimers that say their products are for sun protection, not rain protection. Although they give instructions for pitching the awning in the rain (set the poles at different heights so water can run off), they don’t recommend it. Things also seem to still get wet if they’re not completely up against the van. That’s partly because there are no side walls on the awning. Of course, that would be the same if you were using a pop-up canopy tent. The companies are even more cautious about wind. The automatic electric models have built-in wind sensors that will close the awning up automatically if it gets too gusty. Manual awnings can be staked down directly, or even with additional guy ropes, but the biggest issue is that the roof/wall attachment points aren’t designed to be strong enough to support a large sail. 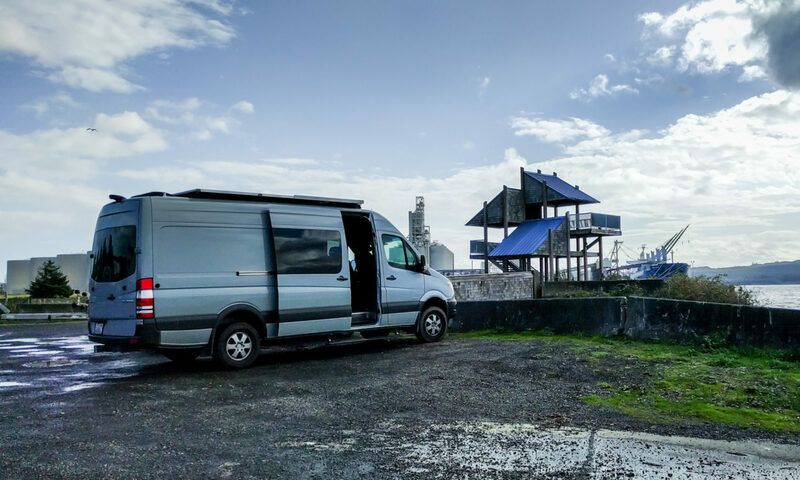 There are stories on the Sprinter forum of folks leaving their van on a still morning, only to find their awning wrapped over the roof to the other side by the time they returned because it got gusty while they were gone. Obviously that’s going to cause irreparable damage to the awning and potentially some dents to the van too. On the positive side, an awning can pretty much double the space you have for hanging out. Sitting under the awning feels more in touch with nature than sitting inside the van. It also lets you hang out with friends without feeling so cramped. It means less dirt tracked inside too, because more activity takes place outside the van. Setting up the awning only takes seconds if you have the automatic electric version, or a couple of minutes maximum with the manual model. It’s much faster than a similar size tent would be to deploy. An awning isn’t for everyone, but if you camp in hot sunny areas or want shelter for winter cyclocross races, the awning can be a great addition to your van.